Last night I played cards with some friends, and my friend Tom is a Canadian Club fan and Dawn is more of an Irish/American blended fan. My go to whiskey is generally bourbon but sometimes scotch. Rye is an occasional drinker for me. But there are very good ryes out there. I keep bringing them over to Tom and Dawn’s because the taste is similar to what they like and sharing a bottle with friends is great because you are enjoying something together even if it isn’t your favorite. On Tom’s birthday party recently I brought over some Willet Family Estate Four Year Old Cask Strength Rye that was a big hit. 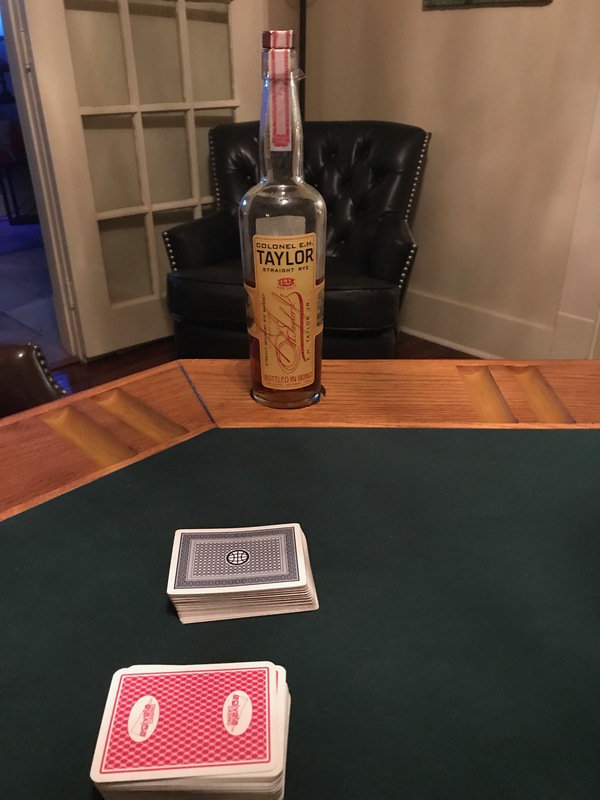 But last night I pulled out the big gun- Col. E.H. Taylor Rye, 100 Proof bottled in bond. I have to say I was impressed. Mahogany in color so it has some age on it but also this recipe is nearly 100 percent rye, with a little barley added; no corn. This is unique in the world of American rye whiskey. Most American ryes on the market do have corn in the mashbill, essentially flipping the typical bourbon mashbill; more than 50% rye and the rest corn and a little barley. The reason for this is a practical one; the mash leftover from the fermentation of a 100% rye whiskey leaves a sticky mess in the fermentation tank that is hell to clean. So most Rye producers add corn to the mashbill to lessen the problem. Typically, this is what Buffalo Trace does. However, for the Taylor Rye they made it the old school way despite the difficulties in cleaning the fermentation tanks. Really really good rye. Spicy but well balanced flavors. Tom and Dawn really liked it and were surprised how smooth it was despite being 100 Proof. It reminded them a little bit of Seagram’s 7, as it should have. This kind of rye was the base for Seagram’s 7, which was then cut with grain neutral spirits to cut the cost of the whiskey which, in turn muted the wonderful flavors this straight rye has. One last point with the holiday bottle sharing season around the corner-if you have friends or family that are big into Crown Royal, Canadian Club, or any other rye based whiskey that is cut with grain neutral sprits before bottling, maybe get them a bottle of good straight rye whiskey as a gift. It’s the same flavor profile; just more of it.